When people have been treated well, thank you quotes may be a helpful resource for you when it comes time to saying your thanks. We have compiled some thank you quotes and sayings of gratitude for you to hopefully help with your search. Feel free to use any of these for whatever you feel they will be useful for. Saying �thank you� creates love. I thank you very much. It was a great experience for me to see and feel your sensitivity in caring for others. You�re one of the nice people I have ever met. God loves a thankful heart. Am thankful that I now see more reasons to be thankful in life�For everything in life. Thank you Lord. Every time we remember to say �thank you�, we expience nothing less thank heaven on earth. A thankful heart is not only the greatest virture, but the parent of all other virtures. You are a gift from God, so loyal and caring. I could not ask for a better friend. Life can be so busy for so many of us, but the ones who stop to care for others is the one who will be in our hearts forever. Thank you so much for thinking of us. We are so grateful to you for taking the time to visit. I love you so much. You are a breath of kind hearted inspiration. Thank you. I am so grateful for everything you have done for me and my family. We are lucky to have a friend like you. Who could ask for a more loyal friend than you. Many gratitutes flowing your way from us to you. There aren't too many people I feel indebted to, but you are defiantely one of them. Many thanks! I certainly owe you one! This is my I owe you thank you message filled with love and sincerity! I have three simple words for you, I...APPRECIATE...YOU! You are truely a blessing sent to me from a higher power. Thank you for coming to my rescue! This is great and so are you for doing it. Anytime you feel the need, we are always happy to receive your good will! Happy and very thankful! Only a true friend would make such a commitment for another friend. 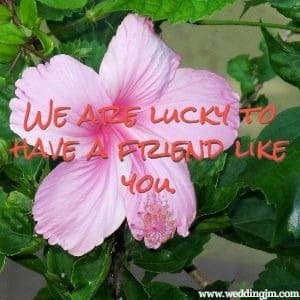 I am lucky to have you as my true friend. Thanks again! Have I ever told you how much you light up my life. Just having you close by I feel happier and everything seems so much brighter! Thanks for being you! You are one of the most helpful people I know out there and I want to make sure you know how much you are appreciated, not just from us, from many others you've helped out! My heart is full of thanks for your thoughtfulness! You inspire me to be a better person. Thank you for that! Did you know you are probably one of the most generous people out there that I know! There are no limits to the generous things that you do! Not only are you such a delight, but the gifts you give are so delightful as well. Thank you! You have no idea what your gift has done for me. I will forever be indebted to you! My mind is blown at your everlasting love for your neighbours. Your gift means so much! I wish you could see the smile on my face! All you would see is a overwhelming look of gratitude! Some great surprises and some that make us bawl. 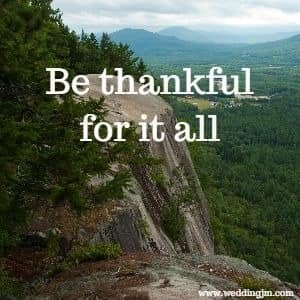 You have to be thankful for it all. The free will to make our own choice. And many continue to rejoice. You are not the only one getting this will. And their mayhem can over spill. He gave us what we wanted. He will help you deal with the unwanted. How would we know it is good? It would be a life of falsehood. It was a selfless act we can never fully understand. Sometimes happiness needs to be unplanned. Be thankful for the good and the bad. Sometimes we have to feel sad. We see this big and small. My hear is filled with love. You were sent me to from someone above. Probably bigger than the rest. I know its because you're the best. Honestly, taking the time to acknowledge their thoughtfulness is all it really takes to feel appreciative. And don't ever think that too much time has passed for you to share your thanks! There is never a bad time to say "thank you" to someone special!